You remember the Summer of Love? 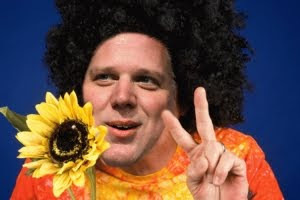 Well, we have a new counterculture on our hands, and Glenn Beck is the new Abbie Hoffman. Check out Michael Lind's piece in Salon. A fascinating look at how the tables have been turned and the right is now the counterculture. And they're even stupider than the left was when they were the counterculture.... it's like they don't even know it! I think Glenn Beck is crazy, sloppy with his facts, and he clings to a reality that is different from yours & mine. He's a PT Barnum-style huckster for 21st century politics. A Merry Prankster? I know some folks don't like Obama always blaming Bush, but c'mon, sometimes things like this chart make it painfully clear... The stimulus bill worked, and Obama is doing a good job. I know that disappoints a lot of folks out there, but there you go! Not sure about the Buzz yet, but it sounds a heck of a lot better than Twitter, am I right?